Puyo Puyo Champions (known in Asia as Puyo Puyo eSports) is coming to the PlayStation®4, Xbox One™, Nintendo Switch™, and Steam® for PC on May 7, 2019 – just two weeks from now – for only €9.99! Whether you’re looking to sharpen your skills or want to see what all the excitement is about, the latest entry in the colorful puzzle series lets you partake in the popping sensation that is Puyo Puyo at a very affordable price. Publisher The Arcade Crew today announce with developer Joymasher that Blazing Chrome, the co-opable fight to save Earth from an impending hellish rule of AI which would feel right at home in any arcade, will reach Xbox One in addition to the already announced Nintendo Switch, PlayStation 4 and PC this spring. Brazilian development duo JoyMasher has been creating games for the better part of the last decade, garnering a cult-like following among its fans for producing high quality indie titles. 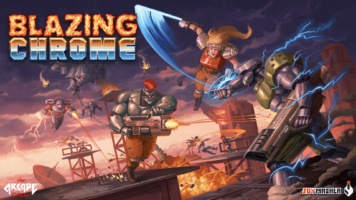 In the latest developer diary released by publisher The Arcade Crew for JoyMasher’s upcoming arcade shooter Blazing Chrome (PC, Switch, PlayStation 4), the video reveals that the long road of development isn’t all paved with roses.